Description: Another area where you can realize cost savings and productivity imporvements is takes. Though you're probably accustomed to using lumber stakes because they're cheaper, the fact is, Steel Stakes can save you money. * Steel Stakes don't splinter or split like wood stakes. * Steel Stakes are required for a give application. * Steel Stakes drive and pull easier than wood stakes. * Steel Stakes outlast wood stakes, many time over. * Steel Stakes are ready to use - no cutting. Symons offer a complete line of 3/4 inch and 7/8 inch round stakes, either with or without nail holes, in lengths from 12 inches to 48 inches. In addition, Symons has I-Beam Stakes for even more rugged use. 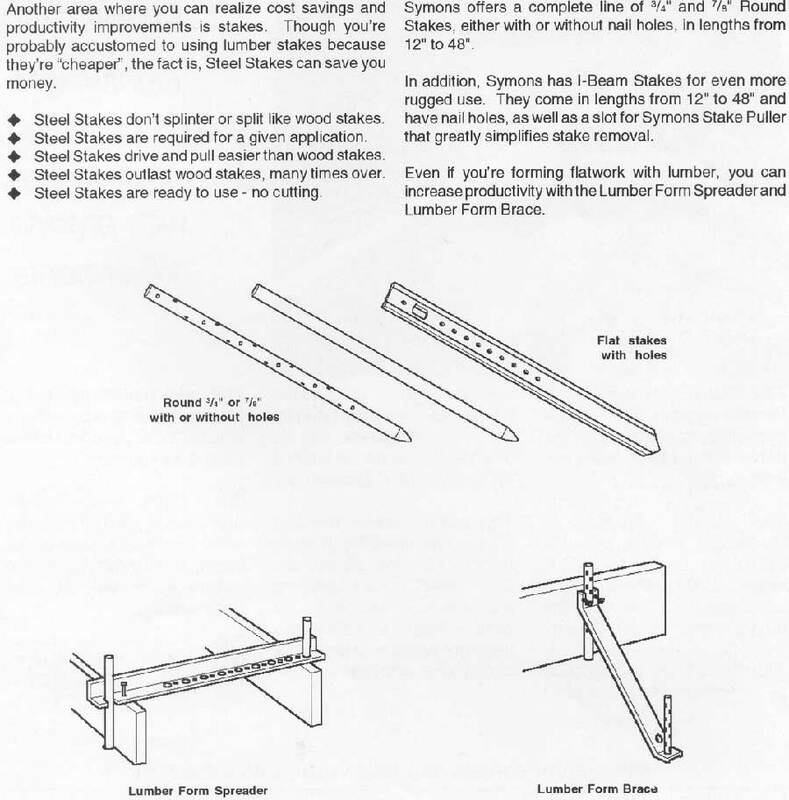 They come in lengths from 12 inches to 48 inches and have nail holes, as well as, a slot for Symons Stake Puller that greatly simplifies stake removal. Even if you're forming flatwork with lumber, you can increase productivity with the Lumber Form Spreader and Lumber Form Brace.